Qatar Airways has continued its expansion plans with the launch of direct flights to its third destination in Turkey. The airline’s inaugural flight to Istanbul Sabiha Gokcen International Airport touched down on Thursday evening to mark the five-star airline’s 140th destination from Doha. The historic flight signaled the start of a four-times-weekly service to Istanbul Sabiha G?k?en, extending the airline’s reach in Turkey’s largest city, a Qatar Airways press release, issued today, said. The route, which will be operated by an Airbus A320, with 12 seats in Business Class and 132 in Economy, will be Qatar Airways’ third route to Turkey, in addition to dedicated flights to Istanbul Ataturk Airport and Ankara. With the addition of Istanbul Sabiha Gokcen, the number of flights to Turkey rises from 14 to 18 frequencies each week. A water cannon salute and traditional Turkish folk dance show greeted the inaugural flight, which carried Qatar Airways Chief Commercial Officer, Marwan Koleilat was welcomed by airport officials and dignitaries including Chief Executive Officer of Istanbul Sabiha Gokcen International Airport Gokhan Bucday and the Ambassador of Qatar to Turkey, HEMr. Salem Mubarak Al-Shafi. Speaking at a press conference in Istanbul, Marwan Koleilat, Qatar Airways Chief Commercial Officer, said: “Qatar Airways has reached yet another key milestone in Turkey, with the launch of four additional weekly flights to this fast-growing country. 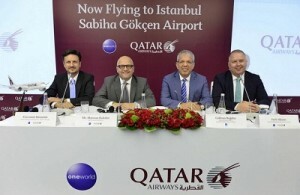 “Istanbul is a magical city that is rich in history and culture so we are thrilled to be providing this new scheduled service to Istanbul Sabiha Gokcen, an airport that serves as a vital connecting hub between Asia and Europe.” With the new route, Qatar Airways will be serving travellers from the eastern (Asian) side of Istanbul in addition to Ataturk Airport which currently services the population in the western (European) side of the city separated by the Bosphorus. The Istanbul Sabiha Gokcen operation provides a non-stop link to Doha with excellent onward connections to over 100 destinations, including popular destinations like the UAE, Saudi Arabia, Bangkok, the Maldives, Bali, Singapore, Melbourne and Hong Kong. Bucday said: “The new route is expected to further strengthen Qatar and Turkey’s strong business and commercial links and help to meet increasing tourist demand, driven by a recent upward surge in Turkey’s tourism industry.” Flight schedules between Istanbul Sabiha Gokcen Airport and Doha, are as follows: Mondays and Saturdays: Depart Doha QR243 at 1355 hrs, arrive Sabiha Airport at 1810 hrs Depart Sabiha Airport QR244 at 1905 hrs, arrive Doha at 2300 hrs Tuesdays and Thursdays: Depart Doha QR243 at 1320 hrs, arrive Sabiha Airport at 1735 hrs Depart Sabiha Airport QR244 at 1835 hrs, arrive Doha at 2230 hrs Qatar Airways has seen rapid growth in just 17 years of operation, to the point where today it is flying a modern fleet of 134 aircraft to 140 key business and leisure destinations across Europe, the Middle East, Africa, Asia Pacific, North America and South America. Over the next few months, the network will grow further with Edinburgh, Scotland (May 28, 2014), Miami, USA (June 10, 2014), Tokyo Haneda, Japan (June 18, 2014), Dallas/Fort Worth, USA (July 1, 2014) and Djibouti (July 27, 2014).